The phone and tablet are Android based so you can personalize with access to thousands of online apps. 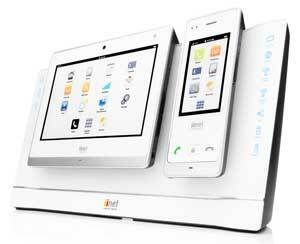 Both devices can work as cordless phones for calls over the Internet using iiNet’s NetPhone service. With the tablet’s built in camera you to make video call to friends and family. The base of the Budii (built on Celeno chip technology) acts as wireless router with multiple access points for web surfing and video streaming. The Budii also has seven 1G Ethernet ports for network compatible appliances that are close enough. Budii allows user to browse the web, watch online videos/TV and make phone calls at the same time. The Budii base unit is available with one included handset, starting from $19.95 per month for equipment rental or you can choose to spend $399 on a bundle with 24 month iiNet broadband plan. Also in the pipeline to release this year is iiNet’s Smartlife, a software solution; which according to iiNet will change the way Australians monitor and control energy use in their homes.